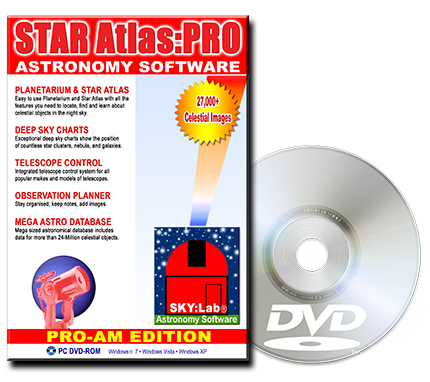 STAR Atlas:PRO is a sophisticated software application that includes many useful and powerful tools coupled with 2.8 Gigabytes of astronomical data, that you can search, browse, list, sort and chart. The How-To Docs set out below, aim to allow both beginner and experienced users to gain full benefit from STAR Atlas:PRO. They are written (by other amateur astronomers using STAR Atlas:PRO in the field) to give examples of how to use the software in many situations. The authors hope that this will enhance the fun of working with STAR Atlas:PRO and will allow both amateur and experienced astronomers to fully utilise STAR Atlas:PRO. Beginner When should I use Polar and Horizon views and how ? Beginner When should I use the Field of View command ? Beginner How should I use the Magnitude Filter ? Beginner How do I Identify Celestial Objects and display their Astrophysical data ? How do I Identify Stars when No Labels are displayed ? Beginner Can you change the Font sizes and the Size of Stars on Star Charts ? Beginner How Do I Turn On the Alt./Az. Grid ? Beginner How Do I Turn On Star Name Labels when displaying the All-Sky Chart ? Intermediate How do I use Colour Schemes in STAR Atlas:PRO ? or Any Other Date I Choose? Intermediate How much of the Sky will I see through my own Telescope, Eyepieces & CCD Camera ? Intermediate What is the setting "Display DSS Image Outlines" and how do I use it ? Advanced What is the setting "Distinguish Non-Stellar Objects" and how do I use it ? Beginner How do I find the location of a known celestial object, like Messier 42 ? Beginner How do I find a Star by name ? Beginner Was the Star Sirius Called the "Dog Star" ? How Can I find Out ? Beginner How do I find the "Witch Head Nebula" by name ? in a certain Constellation and within a certain Magnitude Range ? Beginner How do I Print an Ephemeris of the Planets ? Intermediate Can I generate Lists of celestial objects ? Intermediate How do I find the time that Astronomical Twilight occurs ? Intermediate Can I locate an known object, like ESO350-40B, using all Keyboard commands ? Intermediate When I choose [Locate] the Astro Database Manager displays dozens of buttons with Astronomical Catalogue Designations. What are these buttons and how to I use them? Intermediate I understand Alpha Scorpius has a Hot Companion Star, can STAR Atlas PRO tell me if this is Correct and what Other Information can it tell me about Alpha Scorpius ? Intermediate Can I list the individual galaxies that make up each Hickson Compact Galaxy Group? Advanced I wish to chart the distribution of Galaxies across the Night Sky to assist in locating large clusters of galaxies, can this be done ? Beginner How Can I Obtain Information about Planets to Enhance My Viewing ? Beginner Can I print a list of the Planet Rise and Set times ? Beginner What time will the Great Red Spot on Jupiter be visible ? Intermediate I'm going planetary observing next week, where will the Moons of Jupiter be ? Intermediate What can I learn about Comets in STAR Atlas:PRO ? Intermediate How do I update the Longitude of the Great Red Spot on Jupiter ? Advanced How do I Print an Ephemeris for the Comet of my choice ? Advanced Can I display the positions of Jupiter's Moons in real-time ? Advanced Can I animate Jupiter's Moons back and forward through time ? Advanced How do I search for Double & Multiple Stars that have a particular brightness range ? Advanced Can I search for Variable Stars that exhibit particular brightness ranges and variability periods ? Advanced Can I list the Stars discovered by Hipparcos to be Variable, and can I list only ones in a certain Magnitude range ? Intermediate How do I add objects to the Observation Planner ? Intermediate How do I use the Observation Planner to find Target Objects for tonight's Observing? Intermediate How Can I Use The Observation List Generator And What Can I Obtain From It ? Intermediate Can you add your own Images ? Intermediate How Do I Attach My Own Pictures To Celestial Objects And How Many Can I Add ? Intermediate How to use the Palomar Digitized Sky Survey (DSS) Interface ? Intermediate How do I download DSS Pictures of objects that interest me and make them the size that is best for me ? Intermediate Can I have more than one DSS picture of an object attached to that object ? Beginner How do I setup the Telescope driver for my automated Telescope ? Beginner How do I setup the Telescope Driver Options - Comms Timeout, Chart Update Interval ? Beginner How do I setup the Telescope Driver Options - COM: Port, Baud rate ? Intermediate How do I control my automated Telescope using STAR Atlas:PRO ? Intermediate If I know the designation of an object, can I get STAR Atlas:PRO to slew my scope straight too it ? Intermediate How can I slew my scope to individual objects when they are clustered together ? Intermediate Can I slew my telescope with it's own controls and Track where it is pointing ? Intermediate I have entered all my Eyepieces with their respective Apparent Field of Views. How do I get the chart to display the actual FOV where the Telescope is pointing ? Beginner How do I set up and use the Argo Navis™ so it will work with STAR Atlas:PRO and what can I expect to see ? Intermediate How Do I display the Argo Navis™ Internal Temperature & Encoder Step Positions ? Advanced I’ve Stored Dozens of Objects in the Observation Planner, Can I Download Them into my Argo Navis™ ? Beginner How do I setup the Geographical Location and Time Zone that I am in ? Beginner What is Pixel Mode and How do I use it ? Beginner How do I set up and use the Argo Navis™ (NGC-superMAX™) so it will work with STAR Atlas:PRO and what can I expect to see ? Advanced Where do I find details on making a cable to connect my computer and telescope ? Beginner Is 800x600 the best screen resolution to run STAR Atlas:PRO ? Beginner What type of computer do I need to run STAR Atlas:PRO ? Beginner What type of computer do I need to run STAR Atlas:PRO ADVANCED Edition ? Beginner How much Hard Drive space do I require to install STAR Atlas:PRO ? Beginner Does STAR Atlas:PRO run on a laptop computer ? Beginner Does STAR Atlas:PRO work when it's installed on a compressed hard drive ?